We highly value the relationship we have forged with sponsor organizations and companies over the years. They share our passion for mathematics education and each of their educational visions complements NCSM's mission and vision for mathematics education leadership. 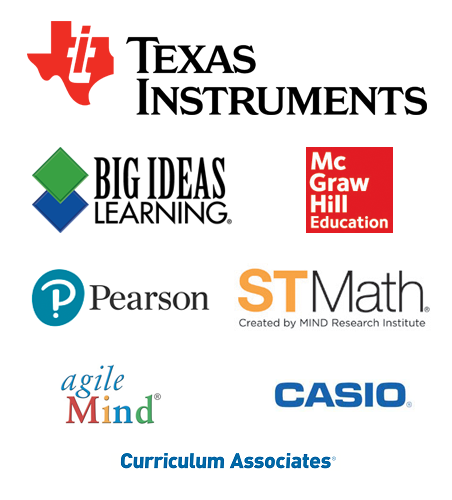 On behalf of NCSM members, we thank our sponsors for their generous contributions. Some have sponsored meal and speaker functions - challenging our ideas, nourishing bodies, and encouraging networking. Some have provided design and production expertise for print matter - allowing NCSM to increase its effectiveness while promoting professional opportunities and enabling NCSM to communicate research-informed positions about mathematics education and the role of leadership. Others have supported NCSM print matter with ads. Still others have contributed technical talent and skill - increasing NCSM's ability to network among mathematics education leaders in the US, Canada, and abroad. Some partners have provided operational services, support, and space - and much more. It all matters. Our work with all sponsors allows NCSM to continually expand professional and educational services to NCSM members and to design high-quality products and experiences for them, as we seek equitable outcomes in mathematics education.